You can also use store-bought shell for this recipe is making one is a problem for you. 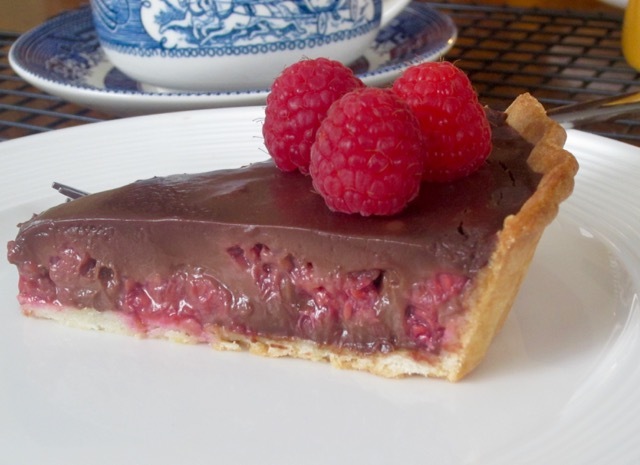 The combination between chocolate and raspberries was amazing. I wish you a wonderful week! Preheat the oven to 375ºF (190ºC) ten minutes before using.You will need an 8-inch (20cm) x 1-inch (2.5cm) loose bottom tart ring or pan lightly greased. Do not grease a non-stick one. Roll out the dough to 11-inch circle (2mm/1/16-inch thick) and use to line the tart pan. Chill in the fridge for at least 20 minutes. Prick the base of the pastry shell. Line the tart with parchment, add some beans or baking beans and blind bake at 375ºF (190ºC) for 20 minutes. Reduce the heat to 350ºF (180ºC), then remove the beans and parchment and continue baking for another 5-10 minutes until golden brown. Remove from the oven let rest 15 minutes before transferring on a wire rack to cool completely. 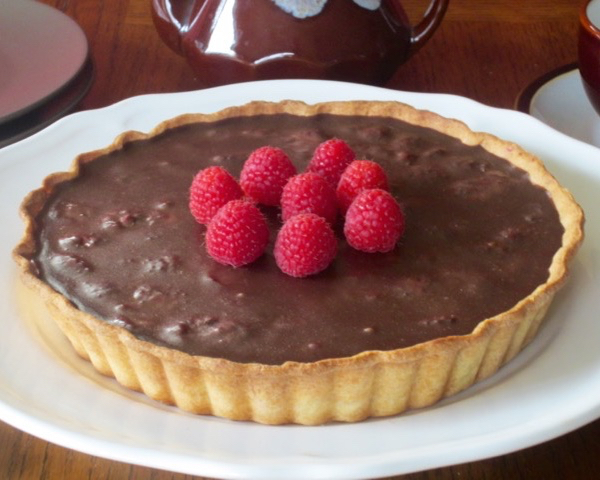 Mix the raspberries with the chopped mint and spread over the bottom of the cooled tart shell. To make chocolate ganache: bring he cream to a boil in a heavy pan over medium heat. Remove from the heat and add the chocolate and glucose and whisk until smooth. Continue whisking and adding he butter one piece at a time until fully incorporated. 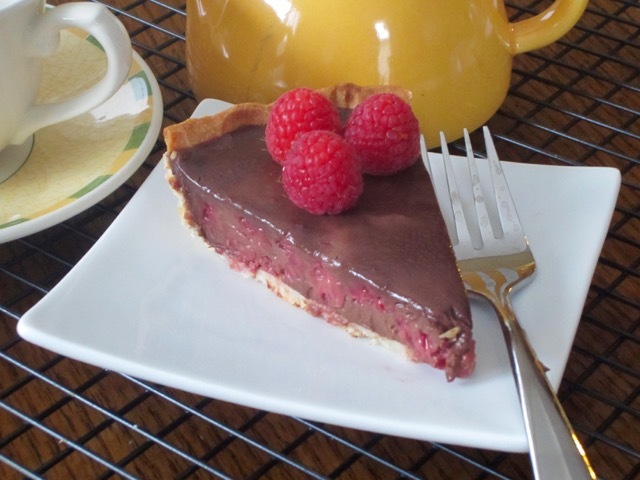 Use a sharp knife dipped in hot water and wiped to cut each slice of the tart. Serve. 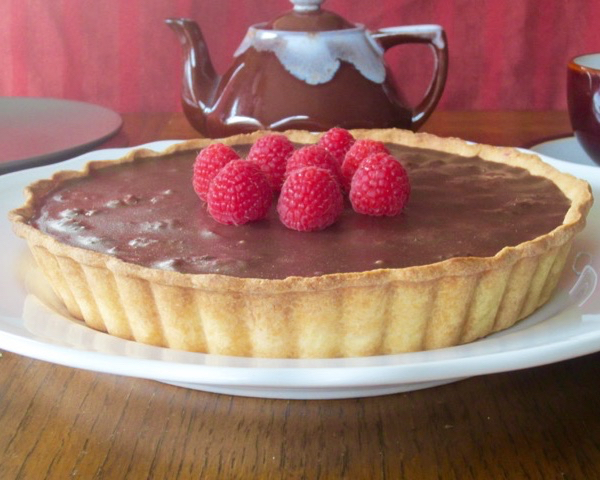 I blind baked at the tart shell at 375ºF (190ºC) for 20 minutes then at 350ºF (180ºC) for 8 minutes. Blind bake the tart shell and let cool completely. 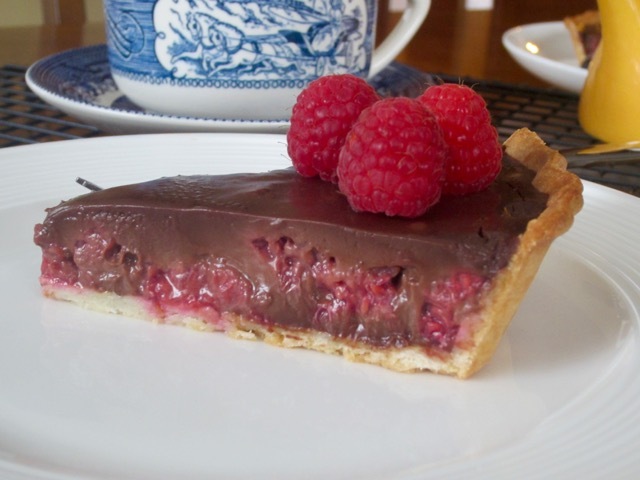 Spread the raspberries over the bottom of the tart shell.